JUST LISTED Furnished - $34,995 This home features: 1. Well maintained and cared for home 2. Side enclosed lanai being used as a man-cave & office 3. Large drive will park two cars easily 4. New air-conditioning in 2016 5. New sink, faucet and water filter 6. New carpet and subfloor 7. Extra storage shed 8’x8’ with electric and hurricane tie-downs 8. New duct-work 9. New ceiling fans 10. New washer and dryer in stainless black 11. Great location just a few blocks from Harmony Pool and Hall 12. Close to the new pickle-ball courts and tennis courts 13. Close to Sunset Pool 14. Close to Ellenton Pool and the new North-Side fitness room ACT FAST & CALL TODAY!! Don't forget to ask about the FINANCING available on this home. Colony Cove is an age qualified (55+) five-star resort community of manufactured / mobile homes. The "Cove" boasts 5 clubhouses, 5 heated pools, a riverfront pavilion and private fishing pier, a private marina, a fenced dog park (very pet friendly), tennis, shuffleboard, new pickleball courts, 2 new fitness rooms, 24 hour patrol, clubs for every interest, and much more. There are daily planned activities throughout the park. Bottom line, if you get bored here, it's your own fault!! The lot rent in Colony Cove is based on the homes' location. While the monthly rent may not be the lowest around, it's by far the best value for the money. Not only does the monthly rent cover all of the amenities of the community listed above, it also covers almost all other monthly expenses such as; water, sewer, trash pickup, all property taxes, lawn maintenance. . .pretty much every monthly expense except electricity and internet. The current lot rent on this home is estimated at $858 per month. 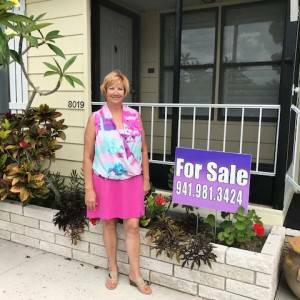 Hello, I am interested in the mobile home for sale located at 7504 Morningside Dr N Ellenton, FL 34222.